Several months ago, I saw a post on I Can Teach My Child combining sensory play with her son's favorite book at the time, "Cloudy With a Chance of Meatballs ." I immediately thought the possibilities to do the same with B were endless. 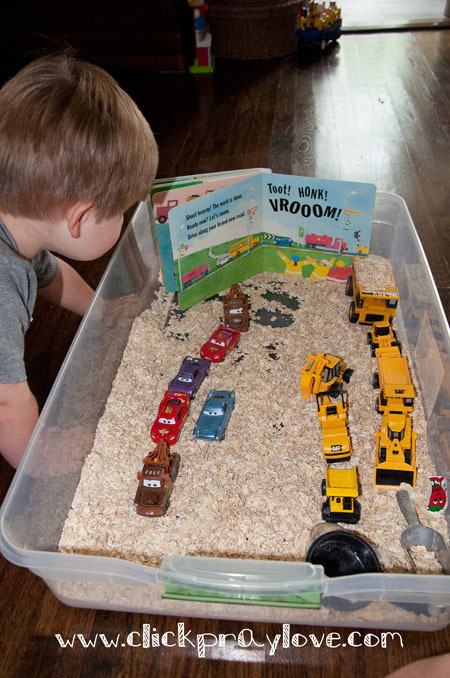 B's friend Emmy-M gave him a book for his birthday titled, "Roadwork! " by Sally Sutton. He really enjoys all of the onomatopoeia words (ie. vroom, whoosh, zap, click, clack, beep) used to describe each step in the process of building a road. 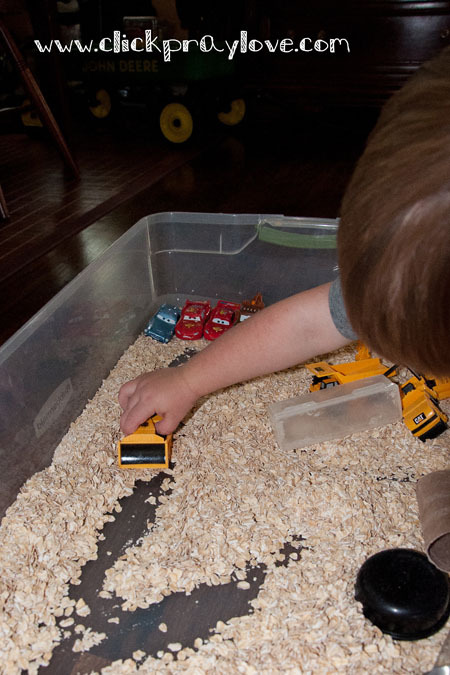 He also received a set of Caterpillar Construction Vehicles from his cousins for his birthday, which made the story told in Roadwork come to life. 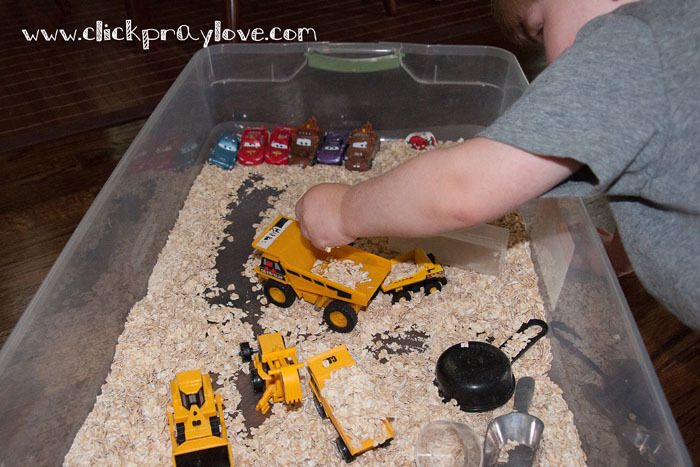 I already had a shallow tub filled with dry oats from our previous sensory play, so I added the construction vehicles and read the book aloud while encouraging him to follow along complete each step of building a road. 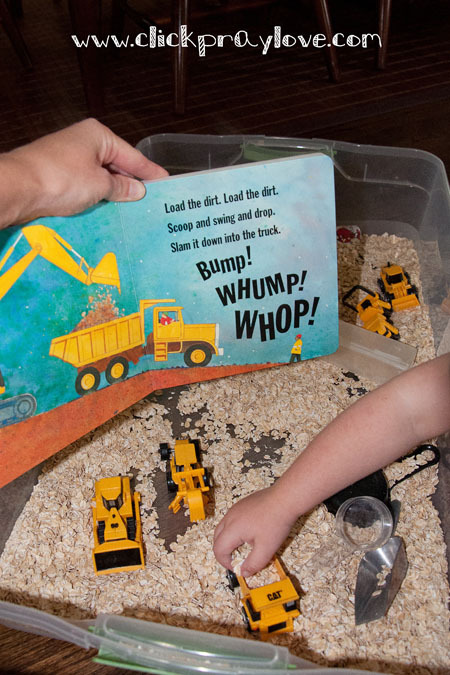 Primarily, we just played, but he did enjoy filling up the dump truck during the page that read, "Load the dirt. 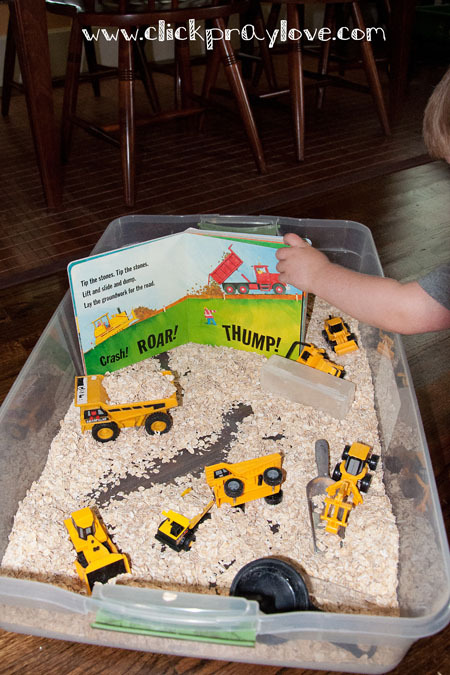 Load the dirt..."
The book and construction vehicles have been a great learning tool for our every day life. There is a lot of construction taking place in downtown Tampa and throughout our weekly drive to my in-laws. B always looks out the window at the construction vehicles on the side of the road making various comments and asking questions. He added the cars which were perfect for the last page of the story. Once the road is complete, all of the vehicles parade along the new highway. As you can see we lined up all of the cars (and construction vehicles) for our own oatmeal parade. I will continue to combine sensory play with B's favorite books. Next up will more than likely will include a book about bugs or sea life. 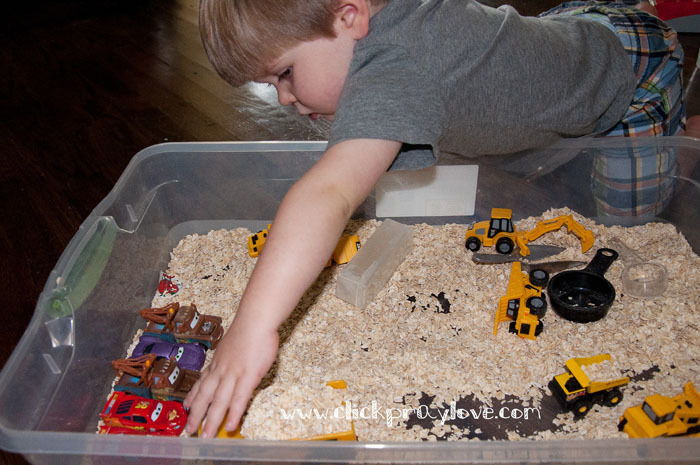 Hopefully, next week I will post about our first sensory bath, which was also construction themed. I have been encouraged to begin sensory baths (when able) as a result of my current favorite children's blog: GROWING A JEWELED ROSE. If you have never paid Crystal a visit, I highly recommend it. 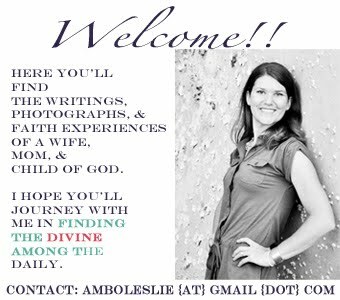 She is incredibly creative and has been a huge inspiration to me. Oh, I can't wait to delve into these links. 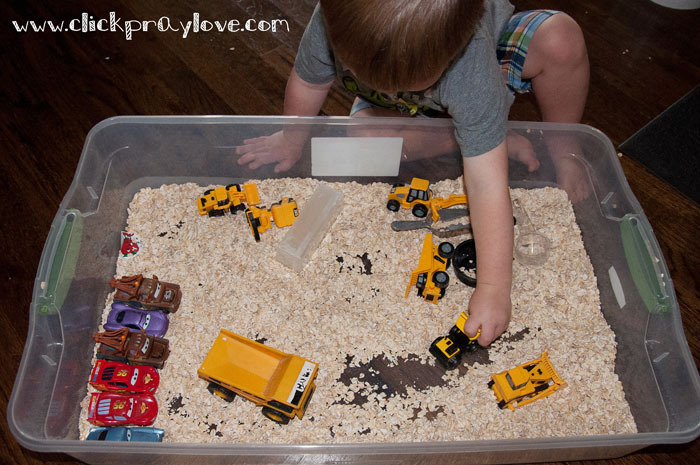 With summer approaching, I'm all about fun ideas for my toddler! Love the oats. wow...I checked out a couple of those sensory baths....very creative girl, that one...When I saw the jungle I thought, "I'd like to soak in that one!" I'm sure Bennett will have a blast in his "sensory baths". Might you repeat some of them for all the little kids when we go back to Fridays at my house? Yeah! Glad he loves his b-day book! Always makes me happy to pick out just the thing a kid loves. Looks like fun to me! You are such a good mom.... And are you sure you aren't a teacher at heart?? It sure sounds like it! !